A more recent version of the ZZT Music Player program. This fails to function under DosBox, but its predecessor works fine. Takes a ZZT file and rips the music directly from it, exporting it to a ZZM file that can be played using the player. Includes ZZT Music player and ZZT Music ripper. Does not function under DosBox, though the earlier version 2.0 does. A very good utility for Windows 95/98/NT that allows you to create ZZT music easily. Very useful for those who don't know how to write music. Just hit a few random notes and you've got a song! 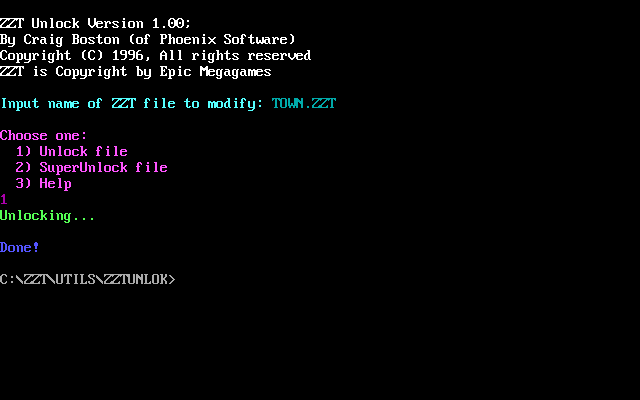 This allows you to change a ZZT game's name. The name of the game is what appears at the title screen under "World." Includes source code. 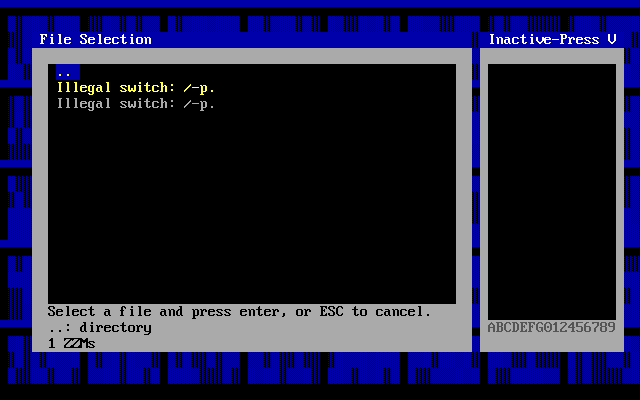 ZZT Under Windows allows ZZT worlds to be run from any folder on any drive with the greatest of ease. 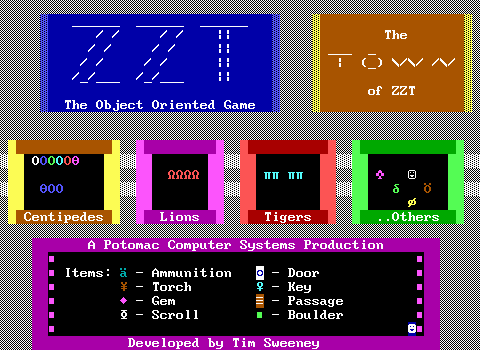 It also allows much easier use of Screen Thief, which is a great help for people like me, who need to take a lot of ZZT screenshots. It also has some pretty good help files. A really old unlocker. Very fast and can unlock all locks, excluding omega. 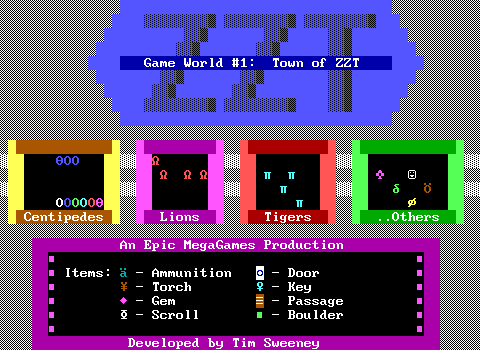 This has been added for nostalgic purposes--to show what the earlier version of ZZT looked like. We recommend not using this for playing OR editing games, though it is worth a look. 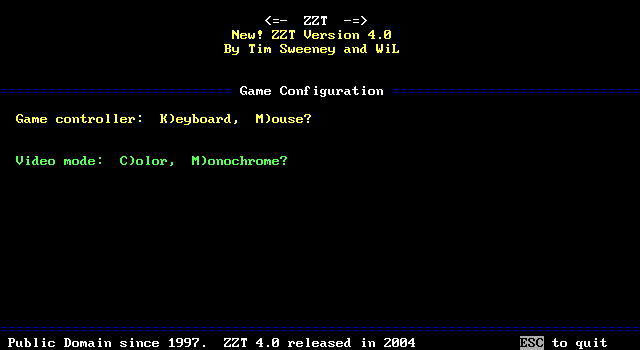 This is the newest version of ZZT, and it is the one you should use to play and edit games. 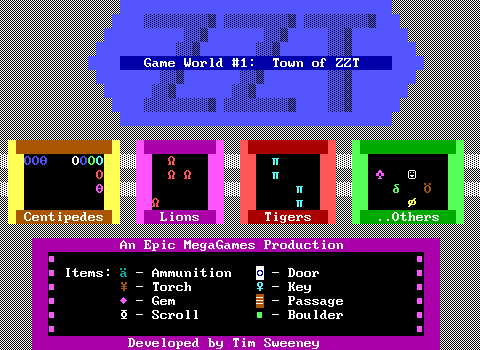 It includes documentation and the 6 original ZZT worlds (Town, Caves, Dungeons, Underground City, Tour and Demo). 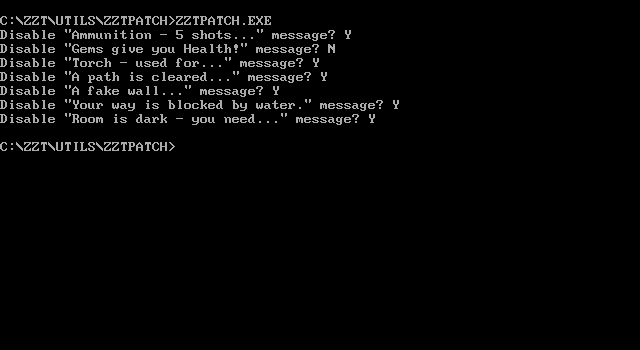 An unofficial release of ZZT that fixes some bugs and increases limits. Board sizes can now be 32k. The bottom row #put bug is fixed. Water no longer plays a sound when touched. Desktop wallpaper inspired by ZZT. Perfect if you're running a 640x480 resolution. 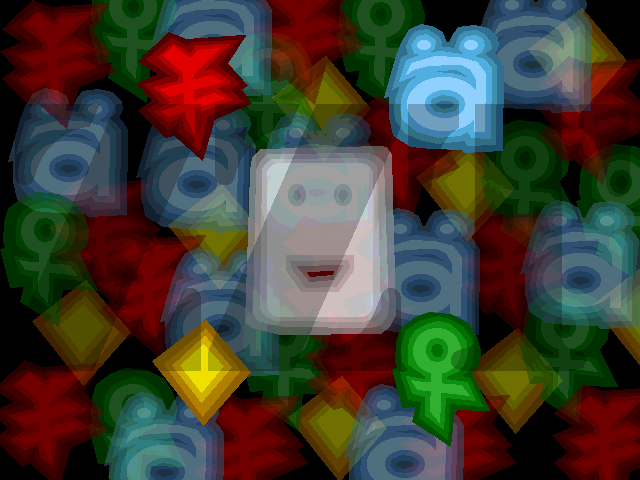 A collection of ZZT and MegaZeux icons and wallpapers making a complete Windows 98 theme. 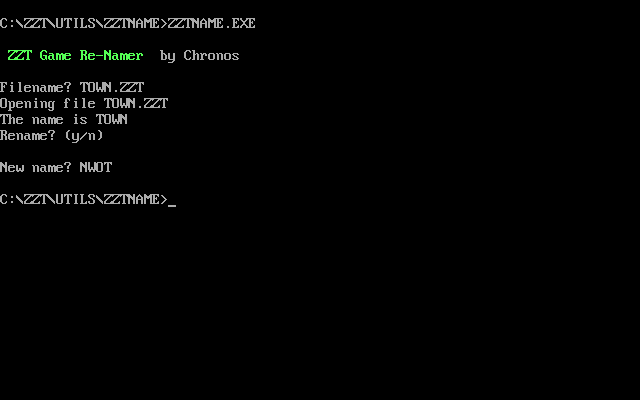 A Python 2 script which can be used to dump all ZZT-OOP code, text, or #play commands to text files. An external editor written in QBASIC. Offers object libraries, a fade tool, and syntax highlighting. 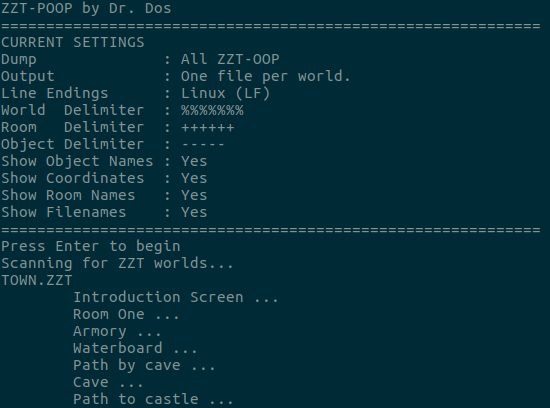 A program to lock and unlock ZZT worlds. This allows you to delete or modify the messages that ZZT has been defaulted with by our benevolent Mr. Sweeney. 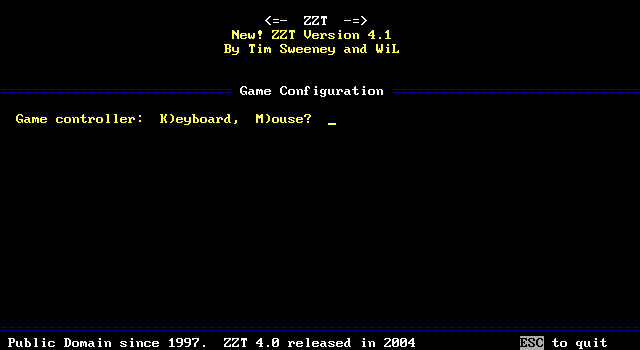 An external editor for ZZT. 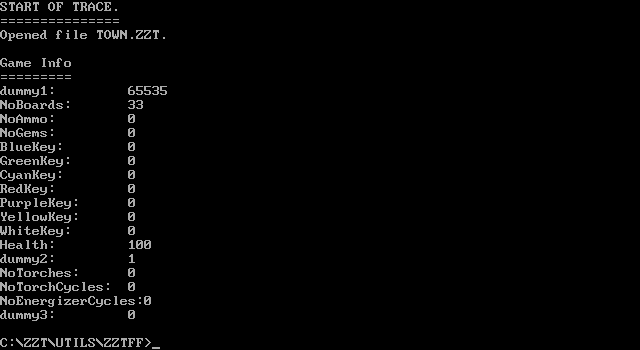 This nifty executable transfers data from one ZZT world to the next, without requiring password systems (or player honesty!). This is, needless to say, rather useful for multi-file ZZT games. Endorsed by Dr. Dos!